There were plenty of story lines in Friday night's NASCAR Southeast Series race at Nashville's Music City Motorplex. The first was "the big one." Just like in last year's first SES race at the old Nashville Fairgrounds track, there was an early race, multi-car accident that took its toll on the field. This year, it happened on the first lap. In fact, the final results will show several drivers who completed zero laps in the 150-lap race. The second story line was that of JR Norris. The super sophomore, who may be the hottest driver in the series right now, earned his third-career pole at the Nashville short track and was the car that everyone in the garage area was pointing to as a favorite to win the race. "He's got the field covered right now, big time," said fellow racer Chris Davidson before the event. The third story line was that of Gary Helton. Helton, one of the biggest Super Late Model drivers in the Southeast section of the country, is actually a rookie in the Southeast Series and has been fast all year long. 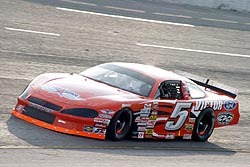 Helton looked like he might have been the only car that could compete with Norris' #5 during the night. All three story lines played a pivotal role in the outcome of the race. It started on the first lap. In fact, it started when the 23-car field came roaring out of turn two. Outside pole-sitter Pat Brewer got high coming out of turn two. Brewer bounced off of the wall and then came back down into oncoming traffic. In front of the entire field, bearing down into turn three. The ensuing accident collected a bunch of cars. A lot of cars. At least 10 of them. 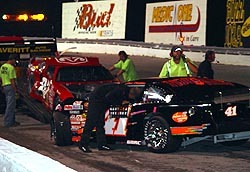 And two of those were the two top points men in the Southeast Series; Dusty Williams and Jeff Fultz. The race also knocked Casey Smith, Charlie Bradberry and Chris Davidson out of the event. Several other drivers lost contention to win, suffering differing degrees of damage. After the restart, Justin Wakefield and Jason Hogan took to the front. The two drivers raced side-by-side lap after lap, trading the lead a bunch of times. Hogan finally took the lead over for good on lap 38 and led for some time. Then Norris, the night's quick qualifier, ran into some problems. Norris, who was just riding around in fourth after starting sixth following the invert, started sliding up the track and losing spots. On lap 46, Norris came into the pits under green flag conditions to change a flat right front tire, losing two laps in the process, and effectively taking him out of contention for the win. With Norris stuck a couple of laps down, Helton had to really just worry about Hogan and Kevin Prince. Prince moved into second when Hogan fell of the pace with a broken rearend gear. When that happened, that left just three cars on the lead lap with all of the attrition and all of the damaged equipment riding around the track. "We had a great car tonight," added Helton. "With these races being 150 laps, I didn't want to use my stuff up right away. I wanted to keep my stuff under me because I knew JR had a killer car. I knew I'd be ok just sitting there and riding. It ended up working out. It was good in practice when we unloaded and we tweaked on it a bit. It was little loose. We didn't tighten it up because we thought it would tighten up tonight and it did." Helton started fifth and was one of the lucky ones who were able to make it around the first lap accident as well. "That car got loose and luckily I was on the inside and I could turn left and get around it,” said Helton. “It was a bad deal for some of those guys." JR Norris made up two laps under green. lead, made his move and got to the front. It was a lead that he would never relinquish and one that he would never be challenged for again. 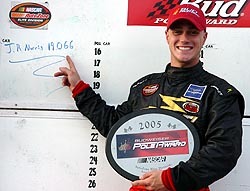 For Helton, he was the first rookie to win since Norris won at Nashville Superspeedway last season. 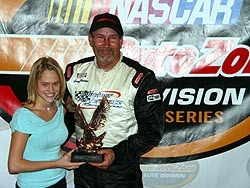 But the win was much more to Helton than just a NASCAR Southeast Series win. It was a win at one of the most historic tracks in the country, and a track that any short track just wants to win at. "It's probably my most prestigious win ever," said Helton of his victory. "To win at Nashville means a lot to any driver from down here (in the South). It's probably our biggest win so far, and to do it with the Southeast Series is great. I've tried to come here and win for years and years in Super Late Models and stuff. I finished second here way too many times. I had one won here one time and a guy spun me out with about three laps to go. This is one place that you want to win at before you hang it up. I'm about to get to old myself. We've had a lot of fun though." Chris Davidson (#41) looks ove the damage to his car while Pat Brewer's #83 gets loaded on the flat bed wrecker. While Helton moved away from the field, most people were watching Norris come back through the field. Norris put on a driving clinic and showed how fast his #5 actually was. Norris got back to one lap down and then motored around the track, trying to get back on the lead lap. In fact, Norris made up an entire lap under green flag conditions and moved up to Helton's bumper with just five laps remaining, trying to get back on the lead lap. Norris pressure Helton and finally got back on the lead lap with just two laps to go. It was something Norris was determined to do. driven that hard in my life. I'm wore out now. Even as the whole race pace slowed down, I stayed a half-second faster than everyone else. That is what is disheartening about it. The fastest car is supposed to win, but it doesn't always win I guess." "We had a good points night," added Norris. "We need to go to Caraway and have another good points weekend and try and win this championship." Prince held on to finish a distant second, with local driver Cecil Chunn coming home third. "We got no practice because of a problem with the oil pump," said Prince. "So our practice laps were the two laps we qualified. We made a couple of changes and had to start at the rear and got fortunate enough to miss the wreck. We had a good car. We really did. But we didn't have anything for the 86. "Second isn't first, but it is a win to us right now, compared to what we went through today." Greg Pope rounded out the top-five. Another Nashville Fairgrounds race, another JR Norris pole positoin.